With just three days to go how is your Money Making Plan shaping up? Today we’re going to consider how you can use Public Relations to raise awareness of your money making venture. In essence what we want is for other people to do the promotion for you without being paid! Advertising can be very expensive and is rarely as effective as an article in a publication read by your target audience. If you have a big budget then you can appoint a PR consultant to get you into the media but this can be expensive and results are not guaranteed. You can improve your chances by choosing your consultant carefully. Make sure that they specialise in your area of interest and that they have contacts in the relevant media; ask to see examples of the coverage that they have got for other people. There is a lot you can do yourself with a bit of time and effort. Remember that journalists are not there to do your advertising for you but to produce stories of interest to their audience. This means that, to get news coverage, you need to have a story not a sales pitch. Surveys are often popular, can you turn your market research into a story without disclosing confidential information or giving away your competitive advantage? Can you celebrate your launch? Are you breaking new ground with your idea? Are you doing something unusual? Can you create a story? Take a lesson from Richard Branson who makes stories when he needs press coverage e.g. by dressing up as a Maharaja and riding an elephant or by abseiling down a building when Virgin Atlantic is opening a new route. 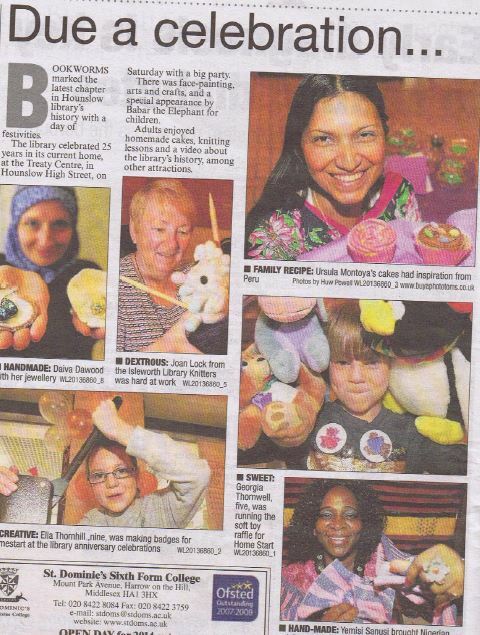 Daiva, Ursula and Yemi from our Hounslow Enterprise Club had their new businesses featured in the local press this week. Turn your story into a news release and send it to named journalists who write on your topic in publications that target your market. Do your homework, Don’t be tempted to blanket mail all journalists, they will bin your release. Think carefully about possible media, you may have success on smaller publications produced on a shoestring than in the mainstream. Think about your local media, small special interest magazines, company newsletters, customer magazines, student media, local radio, smaller TV channels etc. Click on this link for more about how to put a news release together. Remember to keep an eye on your target journalists in your Twitter stream. Are they requesting help with stories? If you can’t help do you know someone who could? Reply to the tweet with an introduction. Re-tweet the message, Compliment them on interesting articles. Share some knowledge or information that will add to the article. Build a relationship. A word or warning. Unlike paid for advertising or advertorials you will have no control over what a journalist publishes so be especially careful about what you disclose in an interview. Off the record conversations don’t always stay that way. Don’t tell a journalist anything you wouldn’t want to read about! Remember a journalist’s primary interest is a good story. ACTION: How are you going to incorporate PR into your promotional plan? Devise a system for getting recommendations and referrals and/or develop your story into a news release and send it to at least one journalist. Should you be running an event? This one isn’t low budget! However running a launch party, an open evening, a party or some other event to which you can invite customers, prospects, journalists, local dignitaries and perhaps celebrities can go a great way to creating a buzz about what you are doing and get you some press coverage. This 21 Day Make Money Challenge has been a PR activity for me and whilst I’d love to see more of you commenting, tweeting or joining us on Facebook it has got people following across the world which was one of my objectives. If you are going to do an event make sure you are clear about what you want to get out of it, set a SMART objective. Set a budget and think what you can do for that money. Get the word out early and often to make sure that people come; there’s nothing worse than having the press and a local dignitary as your only attendees! Ask your friends and family for support if need be. Consider bringing in a professional events planner if your budget will allow. Think what message you want people to take away. Will you deliver a speech? What do you want the press to write about? If you want a celebrity or local dignitary to say a few words brief them about what you want them to say. Do you need business cards, fliers, brochures or a promotional gift for people to take away with them? Don’t just do an event for the sake of it. If you are raising money for charity have lots of ways in which people can donate. If you are doing it to win new customers or raise your profile tell your guests how they can help you. Then go and have some fun! Join us tomorrow to when we’ll be taking action.